Self-taught from a young age, using the books in her father’s library, Abigail Smith married the lawyer John Adams in 1764. They were both committed to the independence movement, and Abigail’s voluminous correspondence provides a window onto domestic and political life in the years of the young republic. Abigail was an early abolitionist and a proponent of women’s right to education. 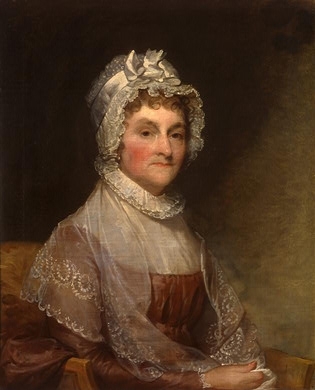 During the Continental Congresses (1774–81) and the Constitutional Convention (1787), she lobbied her husband on many political matters, and urged him to “remember the ladies.” Abigail supported her husband through a diplomatic post in Paris, the vice-presidency under George Washington, and finally the presidency (1797–1801), and managed the family’s business affairs during his extended absences.